Reader’s Digest “The American Way Of Life” — Still Applicable? So, what do you think? Still relevant, still germane, still applicable? I think over 50% of the ‘electorate’ will have no problem with it. So, when was this first published? In March 1949 — 69-years ago. Yes, the pictures I show is of the ‘March 1959‘ issue and that is where I found it. But, if you read the bottom of the picture it says the image was first published ‘ten years ago this month‘ … and that the image has during that time being reprinted over a billion times. Wow. 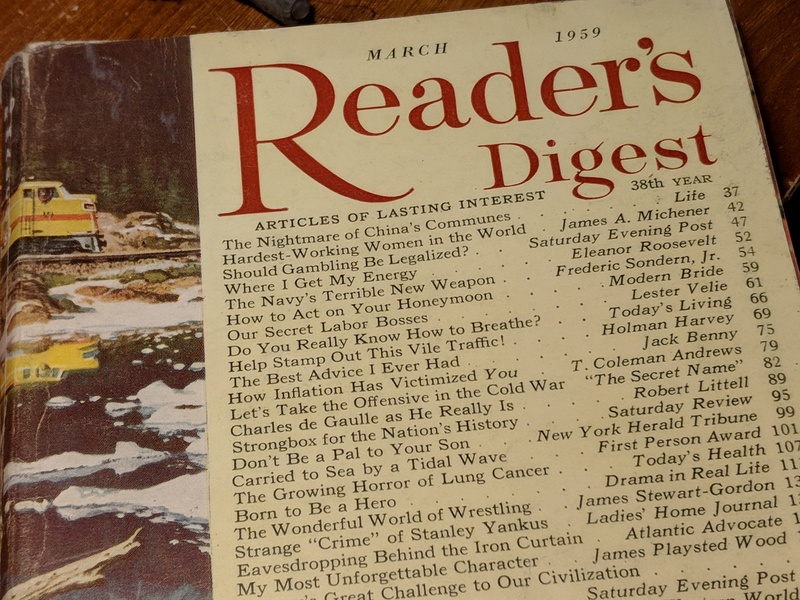 A few years ago I picked up two BIG boxes full of OLD Reader’s Digests — some from the 1950s. This was cool because I grew up in Ceylon, in the 1950s and 1960s reading Reader’s Digests that my father had shipped to him, every month. So, this was nostalgia. The boxes had lain untouched in the attic for years. The other day I grabbed a copy, at random, to peruse. What a difference 59-years make. Today’s ‘RD’ is so superficial, insignificant and SLIM. RDs of the 1950s and 1960s had gravitas and GIRTH. I hate to see these go a waste. So, if any of you are interested, let me know.